Overall: A fantastic year - good company - great fun. Underground, we made some passage and the Breakthrough Fairy gave us a nice pitch to go with it. On the surface, we ate well, we had some good laughs and we drank a few drops of beer. Don't think we could have asked for more. 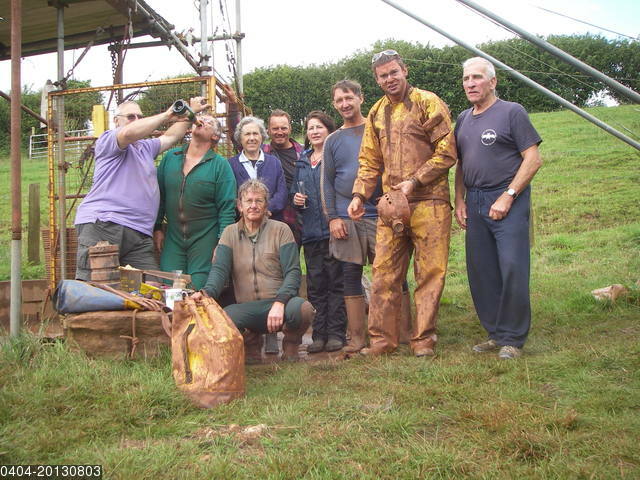 Diggers: Alan Jeffreys (Goon), Alys Mendus, Annie Audsley, Duncan Butler, John Noble, Lucy Greenwood, Mitch Bruce, Olivia Dawson, Phil Coles, Rob Bruce, Roger Galloway, Ian Gregory (Slug), John Williams (Tangent), Nick Hawkes, Jeff Price, Mike Wilson, Caroline Allen, Chris Batstone, Alice Audsley, Paul Brock, Tony Audsley. Visitors: Babs Williams, Clive North, Dereck Hawkins, Desmond Donovan, Digga, Harley Bennett, Helen Campbell, Henry Bennett, Jim Starr, Joan Goddard, Jonny Boland, Lil Romford, Paul Gray, Pete Goldie, Tony Dingle, Phil Romford. Chris and Dereck visited to check that all was OK at the site after the gales of 23rd/24th. Festive preparations meant that there was no digging. This time, the almighty and kindly Thor had wielded his hammer and left behind a satisfyingly large pile of broken rock at the digging face, for which we were immensely grateful. This was cleared from the face, bagged and sent winging on its way in the usual manner. We were now close to the end of the constricted section and eager to get a view of what lay beyond. Unfortunately, someone dislodged a large block from the right-hand wall and this effectively blocked all of the access and most of the view. [Well, it was getting to look a damn sight too promising (T.A.)]. Paul and Nick then had a chiselling session and managed to push the block forward, into the space beyond. Despite their most strenuous efforts, they could not enlarge the terminal slot sufficiently to get in, a pity, but it was a good try. It is quite difficult to judge exactly what lies beyond. We had thought that we were heading towards a cross rift, not so sure now. What is certain is that there was a definite resonant response to 'rift barking', implying some open space beyond the constriction. However, stones thrown into the void flopped into mud and not the hoped for clunk .... clunk ... ... ... BOOM! of a big pitch. Time, as ever, will provide the answer. We hauled 25 bags to grass, leaving about 10 to 12 bags stacked on the first ledge in Annieversary. Back on the surface, Chris fitted a string of Christmas lights in the tea-room and we had a festive get-together eating home made sausage-rolls, flap-jacks, etc. Paul and Tony went to the bottom only to see that the almighty Thor had only half listened to our imprecations last week and there was little that could be done apart from uttering a few of 'They Words' then bag a bit of spoil, stack the resulting five bags on the top ledge and try again hoping that he listens this time. We phoned the surface to stop them coming down, but not soon enough to stop them getting changed. So we all got dirty, which is good because these joys should be shared. It just occurred to me that the Home Close telephone line is probably the only one in the country not being tapped by the NSA and/or GCHQ - come on fellas, get on with it, you are missing a treat ! The day did end quite well. We came out to a VAST array of food; sausage rolls, mince pies, scotch eggs, cherry cup cakes, flap-jacks; far more than any of us could eat. But we tried. One amusing incident, Nick turned up late sporting a fine set of badly bruised ribs. He had been out Go-Karting with some Health and Safety types from his work and had crashed into a wall. It just shows that one can't be too careful. Joan Goddard (MCG) visited to gather material for an article she is writing about digging winches. We fed her lots of information and then a cup of tea to wash it all down. Meanwhile, Paul and Nick cleared the dig face, bagged the spoil and stacked the bags on the top ledge in Anniversary. The atmosphere was a bit cloudy as the draught was very much reduced today. Once the dig face had been cleared, the rest of us came down and performed the usual tasks of moving spoil to the surface and then creating more at the bottom to replace it. When it's expressed like that, it seems a rather pointless occupation doesn't it ? Best not to think about it too much I suppose. Twenty seven bags of spoil were hauled to grass. This leaves three bags and some loose rocks still to shift at the bottom of Annieversary. The way on looks good and there is the possibility of a cross rift some distance ahead. Who knows ? It may even be big enough to get into. We finished the day with home-made sausage rolls, flap-jacks and more tea. to the way on - (sensible fellow). A fine day and a goodly crowd. 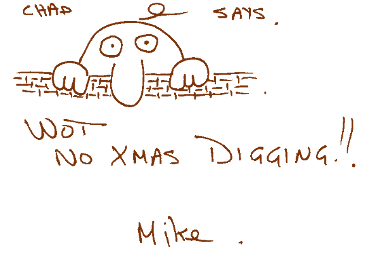 Annie and Roger continued their survey (started 23DEC12) down to the dig face. The results will appear when various muddy bits of paper have been decoded and the numbers put through the mangle. The rest of us cleared debris from the bottom and chained it back to the surface. We then cast a few enlarging spells onto the six inch slot between the walls ahead. A total of seventeen bags were taken out, but there is still a pile of broken rock stacked at the bottom; maybe six bags-worth. At the end of the day we feasted on mini Cornish pasties, flapjacks, short-bread and cheese and onion quiche. First off, a bit of clearing. Paul went to the bottom and cleared, bagged and wallowed while Tony stacked the bags on the (dry) second ledge to get them out of the way for the time being. 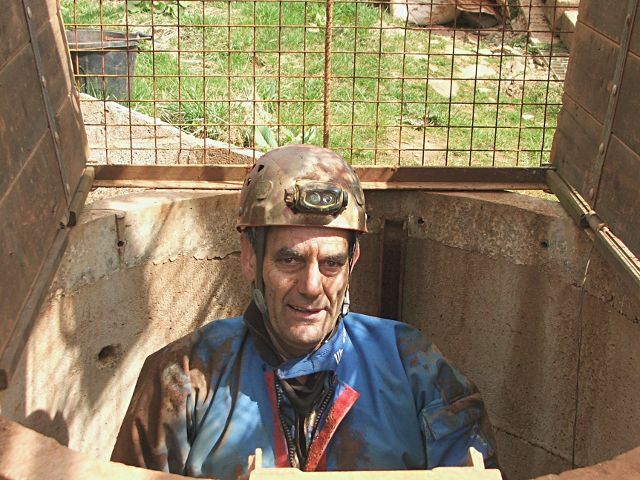 When the dig face had been cleared, Tony went down and did a bit of drilling under the invigorating shower-bath. Meanwhile, the chain-gang hauled, pushed, pulled, stacked and generally had a good time. It was a very enjoyable session and we shifted 17 bags of broken rock and deposited the contents on the surface where, I am sure, they will be much happier. 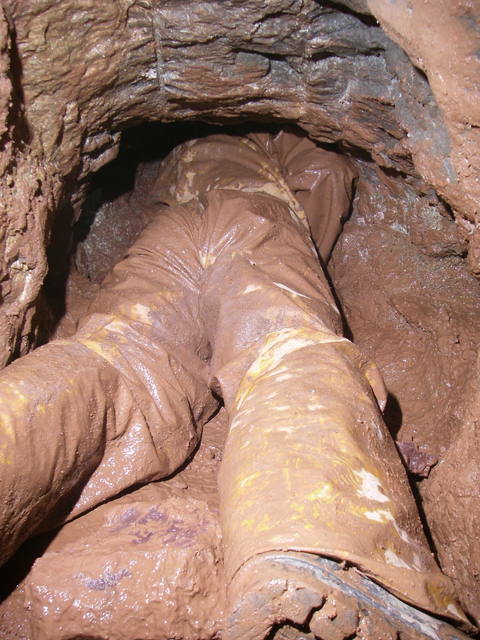 Alice Audsley was away in Manchester this weekend - it's amazing the lengths some people will go to to avoid digging. However, we were able to arrange a replacement Alice in the form of Alys Mendus (SUSS, GSG). OK, different spelling, but sounds the same. Initially Alys, Paul and Tony went underground and Alys went to the bottom of Annieversary to stand in the showerbath and view the wonders of the way on. Two minutes was quite sufficient for her to appreciate in full the delights that the place had to offer; then we settled down to work. Tony at the bottom performed a variant of the usual rites (under an umbrella !) and the chain gang of Alys, Caroline, Chris and Paul bagged, hauled, winched, dragged etc. You can decide who did what for yourself if you like, it was all pretty miserable and wet. However, the end result was the complete clearance of the dig and the neat and tasteful spreading of a fresh layer of spoil on the tip. The umbrella did not survive. Very wet, windy and cold on the surface and rather more so underground. Why on earth do we do this ? Paul turned up with another two lengths of steel ladder and a great heap of tools and bracketry in preparation for fixing same. We carted all this stuff over to the dig in the Land Rover, carving deep ruts into the sodden field. We had intended to start work at the bottom first and drill some holes and then perform the usual 'rites of passage'. However, when we got to the dig face, it was under quite a respectable waterfall and it was difficult to see anything, let alone drill holes in it. OK, scrub that for now and on to Plan B, fixing the ladder. We packed up all the gear and went back up to the base of Tollens where we (actually it was Paul who did most of the work) fitted the fixings for the lower section of ladder from the ledge to the bottom. This took quite a long time and Tony had an attack of hyperwimpishness and started to whinge on about being uncomfortable in the cold draught. We both came out to warm up and have hot sweet teas, then Paul (hero) and Caroline (heroine) went back down and completed the fixing of the lower section of ladder. Paul and Tony arrived first. Paul brought over his SDS Max 110v drill/breaker and generator as well as two brand-new and sparkling six foot (1.8 metre) lengths of steel ladder. Having set the generator running they both went below, bolted the ladders together and tried them (or rather it) for size in the bottom half of Tollens' shaft, below the ledge. A few touches with the electric chisel and the ladder was a snug fit, it only needs some clever bracketry to fix it to the walls of the shaft; a job for next week. That finished with the ladder for the time being, so they went further down and set to work on the floor of the blasted passage, removing the irregularities that had made hauling the boat a bit tricky. Altogether, about five bags-worth of irregularities were removed from the floor. This work was hampered by the generator playing silly games and cutting out at random when it felt like it, despite Mike's efforts to keep it running. So the generator is off into intensive care and we go back to the faithfull Hilti. A great pity, there is no substitute for volts, the more the merrier. It was good while it lasted. There was a relatively early finish because both Paul and Tony were feeling the cold after working in the wet and rather windy tunnel. 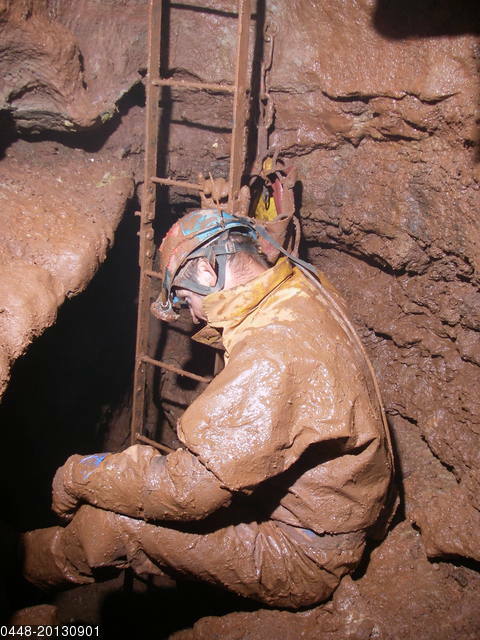 Very wet on the surface and HORRIBLY wet underground. 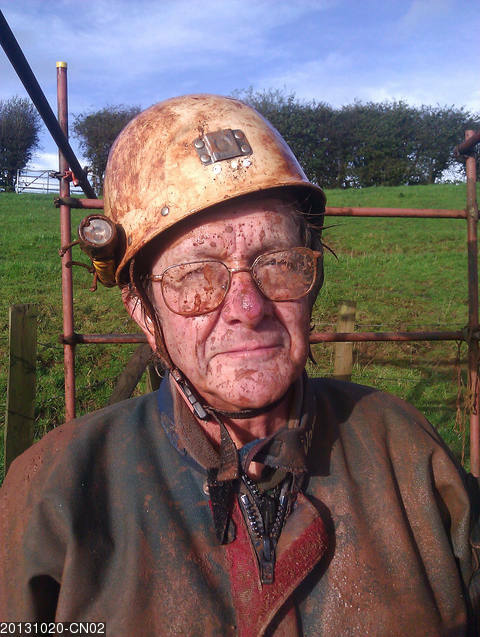 To start with, Paul went to the bottom to clear back and bag the spoil while Tony fixed a new telephone cable from the surface to the telephone point. Tony ↑ Paul → Alice → Chris ↑ Caroline (at the bottom of Tollens). 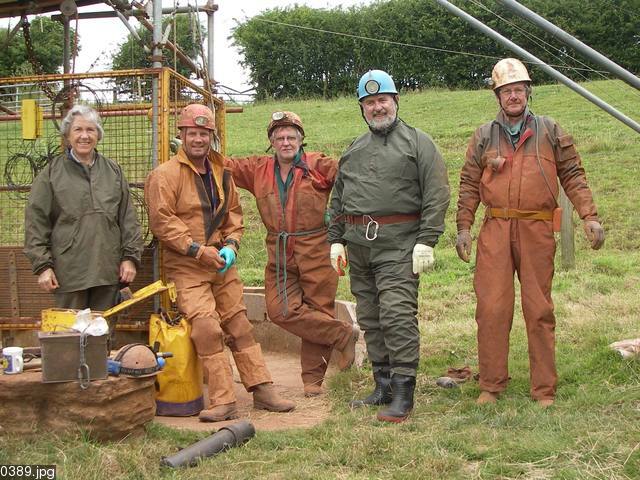 Paul (bottom of Engine Shaft) ↑ Chris (winder) → Alice (bank) → Caroline (barrow to heap) → Tony (emptying bags). That's the full gory detail. It's a bit boring, so I won't do it again. The tasks are all more or less equally unpleasant, so it doesn't matter who does what. From now on you can make the order up for yourselves if you like. As ever, the way on continues small, wet and squalid; but draughty. A horribly wet day on the surface and underground but never mind; last week's incantations had been effective and we were greeted by a pile of rock at the bottom of Annieversary. Once this had been cleared back, bagged and stacked, it was possible to get a better look at the way on. The rift continues onwards and slightly downwards at the standard 15cm wide (at most). There is still a cold, outward draught and a fevered imagination can distinctly hear the sound of water falling some distance ahead. It looks and sounds good. In the hope of making it even better, the usual rites of passage were performed. Much as ever, we cleared the stack of bags to the surface:- Tony ↑ Paul → Alice → Chris ↑ Caroline ↑ Nick → Paul ↑ Tony → Alice → SPOIL-HEAP ! He was accorded honorary digger status for this session for, despite his incapacity, he did shift some bags on the surface. He amused us by repeatedly performing a strange ritual which involved bending forward at 90 degrees at the waist then describing small circles with his dangling right arm. He said the physiotherapist had told him to do it; I think that he may be practising to join a secret society. Chris was strangely under the weather for some reason. He had gone to the BEC dinner on Saturday and, although he can't remember, it seems likely that he must have engaged in aprés dinner activities at the Belfry. Fortunately, it was a fine warm day and he could spend some time lying out on the 'lawn' by the shaft. Paul and Tony went underground to do some fixing. Initially Paul went to the bottom to break up some rock and to improve the fixings of the (as yet) unfixed fixed ladder. Meanwhile, Tony started cable laying down to the new digging site at the bottom; fixing it to plugs drilled into the roof of the blasted approach passage to keep it out of the way of the heavy traffic expected there. The cable was taken into Annieversary rift at roof level then run to the bottom down the 'southern' end of the rift, again out of the way. Then the usual mystical rites associated with the production of a manageable way-on were performed (?Rites of Passage?). This done, we exited to find Alice and Caroline on the point of changing to come down. It was not difficult to persuade them of the error of their ways and we spent the rest of the afternoon on the surface drinking tea and eating hot sausages in bread rolls with dollops of Mexican sauce. By this time, Chris had rediscovered the art of maintaining a vertical posture; very creditable all things considered. All-in-all a good start for the new campaign of driving into the unknown. OK, not really the unknown, we can see quite a way along the rift and it's all miserably narrow and squalid. So what's new ? First off Tony went to see Clive North to borrow a spare Hilti battery with the avowed intention of drilling some holes. He came back with the battery AND a large number of cold sausages left over from an event the Norths had at home yesterday. Never refuse an offer of food. Once we had gathered at the dig, all four went underground; Nick to the bottom of Annieversary, Tony to the transfer position at the top of the ladder, Caroline to haul at the tunnel entrance and Chris to stack bags at the bottom of the builders' ladder. Initially we had problems with the boat tipping over but stacking a couple of small bags of spoil into one of the worst irregularities in the floor cured the problem to a very large extent. Ideally we need to have a session knocking lumps out of the floor - sometime. In quite a long session, something in the region of 35 - 40 bags were shifted; three from the second ledge and the rest from the bottom. These were stacked at the bottom of Tollens by Caroline and Chris. Twenty were then hauled to grass, but general knackeration decreed that a considerable pile of bags remained at the bottom of Tollens; hence the uncertainty about the numbers. Annieversary rift is now clear of loose material and so work can now begin in enlarging the new 'way on' at the bottom. We had tea, ate all but two of the sausages and finished off with Caroline's flap-jacks. 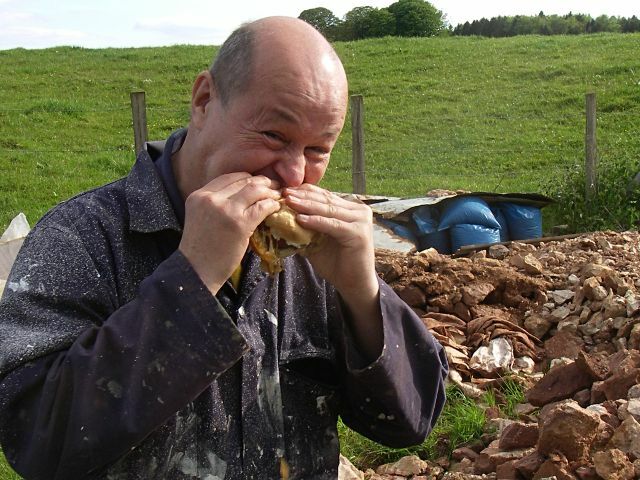 So, in the end, we didn't use the drill or the battery, BUT we did eat the sausages. It's just a question of priorities I guess. Desmond and Tony visited the site on a pleasant, sunny afternoon. Desmond examined the spoil-heap closely and they had a wide ranging discussion about things of a geological nature. A bit of a slow start as we spent some time discussing the whys?, hows? and wherefores? of how best to proceed in the long term. But enough of that, what really mattered was the short term and shifting some spoil down below. So, daydreaming over, Alice went to the bottom of Tollens, Tony went to the windlass, Jeff hauled back from there and Chris stacked at the bottom of the Engine Shaft. Later, Chris drove the winch, Jeff filled the kibble, Alice worked the bank and Tony barrowed and tipped. Mike turned up during this process and helped with emptying bags. 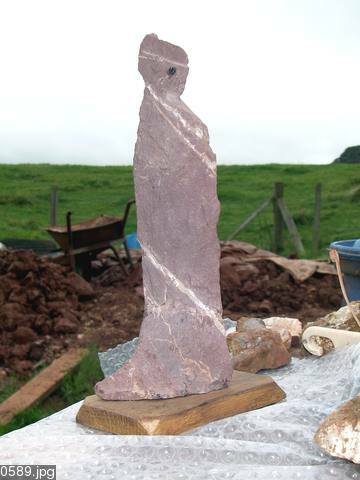 Mike also brought out a figurine he had carved out of a chunk of attle; a wraith-like cloaked figure, the 'Spirit of Home Close'. Holidays got in the way of digging - not good. A hard day and unfortunately, Jeff's back was playing its old tricks on him so he was not able to get underground, much to his annoyance. So we were down to an underground team of four. To start with, Paul and Tony completed the fixing of the top end of the ladder with various bits of bodged ironwork bracketry. It won't win a beauty contest but it's firmly fixed and reaches down to the second ledge (about 2.5 metres above the very bottom. THEN, the start of a digging attempt. Initially, this was just a look see to test the practicality of the system because none of us was convinced that it was going to work. In the event, it worked remarkably well, even hauling a boat along the blasted approach passage did not cause problems. So we can forget about making alternative routes, at least for the time being. Tony went to the bottom to clip on the (~25) bags that had been stacked there by Paul and Tangent on the 14th August and then hauled them with rope and pulley; the latter bolted into the roof near the entrance. Paul perched on the top of the ladder, helping with the hauling and then transferring bags to the usual plastic digging boat (half a 20 litre poly container split lengthways). The boat and contents were then hauled along the blasted approach passage by Alice (or Caroline), who then passed the bag to Caroline (or Alice); confusing, but it just means that they took it in turns. The bottom was cleared of all stacked bags, although there was still some loose rock remaining. Paul went down to attend to this while Alice, Caroline and Tony shifted the bags to the bottom of Tollens'. Finally, Alice and Caroline hauled six token bags up Tollens' using the windlass and later we hauled these to grass. Meanwhile, Paul had bagged another ten bags of rock and stacked these at the bottom. A BBQ had been planned but it was now too late to get one going, so we finished off with burgers and sausages cooked on the gas hob, not quite the same, but they tasted good nevertheless. Paul bolted a hauling pulley into the roof of Annieversary, just inside the entrance. This will allow hand hauling from the bottom of the rift, which is good enough to be going on with. We got the three five foot (~1.5 m) lengths of fixed steel ladder into Annieversary (surprisingly easily) and bolted them together. Paul and Tony then spent a long time, (punctuated by scavenging expeditions to the surface in search of bits, bracketry and inspiration), trying various methods of fixing the ladder in position. We ended up with resin bolts at the bottom and a temporary chain and maillon fixing on the top pending the manufacture of permanent fixings. Alice, Caroline and Chris shifted the only four remaining bags of spoil in the upper part of the dig out to grass. The communal lunch of pork pies/sausage rolls/flap jacks/ginger cake/doughnuts was very filling. An evaluation and house-keeping session. Hard work but not a great deal to show for it in terms of spoil out of the dig. Paul fixed a chain hand-line at the head of Annieversary Rift and enlarged the entrance to the drop, producing several bags-worth of spoil in the process. We then spent some time trying to fix a hauling pulley above the drop so that we could remove bags from below but couldn't get the desired combination of a decent hang for the rope AND decent rock to place a bolt. The best logical combination we could manage was an OR, which wasn't really good enough. We tried lying a disposable digger at the top of the pitch with the rope over his back and shoulder, being hauled by Alice and Chris from way back along the passage. We got one bag up this way, but won't be trying it again. Apart from anything else, the last three metres of passage is too small to get a bag past the digger, with all that this implies. Paul and Tony spent quite some time on the first ledge discussing various options, stemples, platforms and such-like but without reaching any satisfactory conclusion. Meanwhile, Alice and Chris shifted 9 bags to the base on the engine shaft. This total included the first bag removed from the bottom of Annieversary, plus some from the enlargement of the approach, plus a few left over from previous sessions. This done, we broke for lunch. After lunch Paul and Tony went down again. 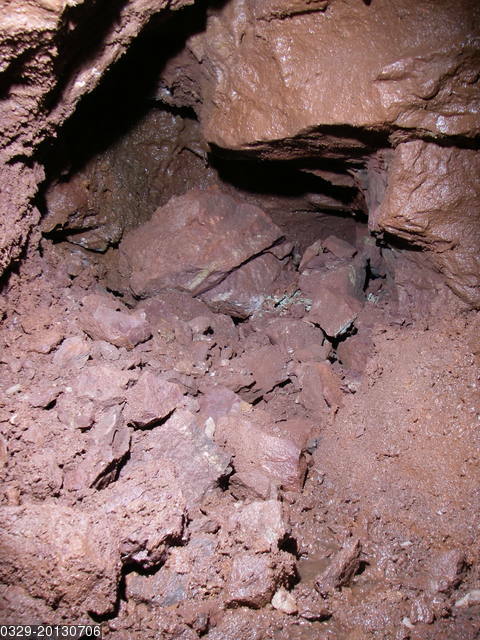 The nine bags were hauled out and dumped, a little more rock was broken under ground and bagged for later removal. That was about it, we cleaned up and headed for the Queen Vic where we continued discussing spoil removal options. Paul and John had an evening session in Annieversary clearing loose rock off the ledges and bagging it ready for removal at the weekend. Altogether, some 25 bags of potential ammunition were immobilised. Paul eased some of the more unstable blocks of bedding from the wall, but there are others that require support in situ. A bit of a depleted team, so an ideal time to catch up with overdue fiddling and fettling. Three new lengths of fixed ladder had been sitting in the hut since our abortive digging session of 9th March, so we tried them for size above the ledge in the upper part of Tollens shaft. Not bad, but the shaft will need a bit of unstitching and letting out to make a perfect fit. A nuisance, but not impossible. We then tried the ladder on the bottom half of the shaft. This was much better, but even so a bit of adjustment to the rift would help. Overall, worth a try, we just need to make up another 15ft (4.572m) of ladder and then bash a bit of rock. We had great expectations for today, which were not altogether fulfilled. 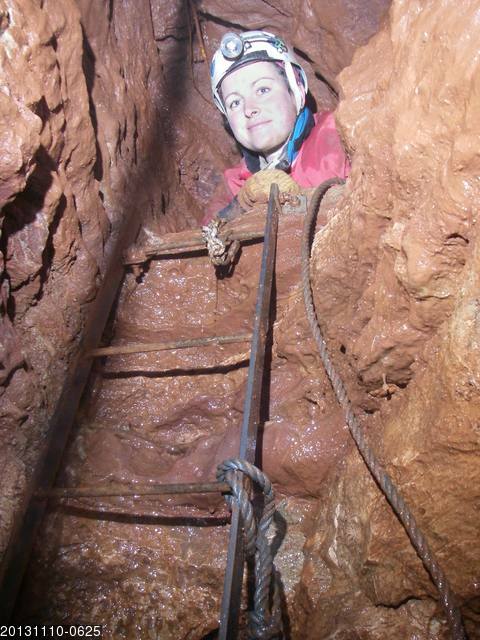 We had put in a request to the Breakthrough Fairy for caverns measureless but instead we got a standard issue, muddy 7m pitch, blocked at the bottom. All the hints of further pitches, boulder slopes and the like were mere figments of fevered imaginations. T'was good while they lasted, but they are no more. Initially this felt a bit disappointing, but thinking about it dispassionately, a major breakthrough would have ruined a perfectly good dig. As it is, there is still spoil to be removed from the bottom and not a great deal of stacking space down there, so some at least will have to come out. We still have a surface dig. PHEW ! That was a bit close for comfort. Now for the grisly details; Jeff, Paul, Nick, Tangent and Tony went down and to start with Tony took a series of not very good photographs for the record, then backed out and left it to Paul and Jeff to get on with placing bolts and rigging the pitch. This done, we all went down and each prodded at various points of the rift as the fancy took us. First impressions are that the rift is about 7 metres deep and floored with breakdown rubble. 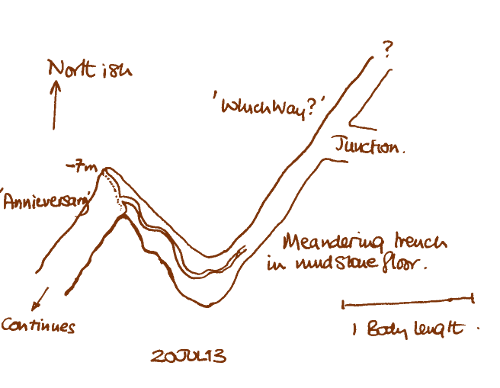 The Mercia Mudstone walls are jagged with deeply etched bedding forming projecting ledges that appear like false floors, but are in fact (more or less) solid rock. The bedding on the east(ish) wall is particularly deeply indented giving rise to in-situ, but semi-detached blocks of bedding, some of which are in need of a bit of moral support. At the bottom at the 'northish' end, the rift closes down to a narrow slot and at floor level a small sinuous trench can be seen to continue for maybe a couple of metres. This may possibly be the 'NEW WAY ON' and the source of the draught. However, there is a voice connection between here and the right-hand passage at WhichWay? junction; in which case one might expect a draught from the right-hand passage as well as the left. Obviously more investigation is needed. All out to the surface and we hauled up the bottle of fizzy stuff that Slug had stashed below (†) a long time ago ready for the next breakthrough. It was broached and consumed and went down well with sausage-rolls (Caroline), flapjacks (Alice) and coffee cake (Nicole Hawkes). This was followed by the inevitable silly photo. Shortly afterwards, Babs, Paul and Helen returned from a walk with a second bottle of fizzy stuff that they had found on the way. They are a resourceful trio and good to have around in times of need. (†) The bottle of fizz had been stored in a BDH winchester quart size protective container, along with a packet of chocolate éclairs. The fizz was fine but the condition of the éclairs can perhaps best be described as unappealing. An evening trip to teach the problem boulder a lesson and to enlarge the head of the pitch, thus making it suitable for elderly gentlefolk. The usual sort of things went on, magic incantations and the like; with any luck they may have been effective. Exited, cleaned up (a bit) and headed for the Queen Vic. Talk about counting chickens before they are hatched, but we took a group photograph of an expectant Old Gang before going underground. Expecting what ? Expecting a breakthrough of course. Ha ! Chris, Jeff, Paul, and Tony went down to the bottom, photographed yet another pile of broken rock for the record and connected the phone. When contact had been established with Alice, she came down, leaving the surface empty as Mike and Caroline were yet to arrive. Faffing over, Jeff and Paul took turns in mucking at the face, Tony bagged and passed back to Chris at the base of Ding-Dong. Alice hauled bags up the pitch and stacked them at the bottom of Tollens'. During the clearing operation, a large block detached itself from the wall and attempted to escape from all the hassle it was getting by leaping down the pitch. Unfortunately, it was too fat to get down. Rather more unfortunately, it was JUST the right size to jam itself firmly in the entrance and there it sat looking incredibly smug and pleased with itself, defying all attempts to move it. So we did not get in. While this was happening, Caroline and Mike arrived, so Caroline worked the windlass and with Mike driving the winch, 21 bags of debris were hauled to grass. Eventually we got cleaned up and headed for a BBQ that Babs and Jeff had arranged to have by their caravan at Eastwater Farm. In the event, torrential rain ensured that Alice and Tony, Paul, Chris, Jeff, Babs, Phil and Lil [Romford] enjoyed lots of food and drink inside the caravan. It is said that "the best laid schemes o' mice an' men Gang aft a-gley" (†). And that's probably very true whatever it means. We certainly did not get a breakthrough nor did we have a BBQ outside in the warm evening sunshine. (Just thought I'd add a bit of an international flavour to the account). An evening trip to show off the dig to Messrs. Coles and Noble and at the same time to open up the entrance into Annieversary. Went to Hunters' afterwards for refreshments and wittering. Tony arrived first on the site and disturbed a hare that had been resting in the long grass near the edge of the spoil-heap. This seems to be a favourite resting spot; hope it returns. The others arrived shortly after, along with Jim Starr, a friend of Tangent and we spent some time nattering about the dig before Jim left, then Tangent, Paul and Tony went underground. Tony took a photograph of yet another pile of broken rock, then set up the telephone and established contact with Alice and Chris on the surface. This done, Alice came down to join us, whereupon Paul and Tangent took turns at clearing the entrance to 'Annieversary', Tony bagged and Alice dragged and stacked the bags at the base of Ding-Dong. During this time Jeff arrived looking shattered having not had much sleep after his night shift on Friday. We all took turns in looking into the now cleared entrance to the new extension. Unfortunately, we still can't (quite) get in but we did get a passable good view into it and Paul got his arm far enough in to take a photograph looking along the rift. 'Annieversary' is a deep rift aligned approximately N/S (determined by guestimation™), entered at the top of the north end. It extends horizontally to the south where there is a rock bridge with a substantial boulder perched on top with some stal pendants above. Below the entrance point, the rift drops some 7 metres to a floor (plumbed with tape). The draught at the entrance is as cold and strong as ever. Thus sated, we exited for tea and flap-jacks, lit the BBQ then went back underground; Paul and Tangent to the depths (a) to have another look and (b) to move bags back to the base of Tollens'. Caroline worked the windlass and Tony dragged bags from her and stacked them at the bottom of the engine shaft ready for hauling out. Mike arrived in the early afternoon. This was his first visit for some time and it was good to see him back. He took up his rightful position next to the winch and Alice and Jeff fielded the bags on the surface. Twenty seven altogether. Finally, we had the BBQ provided by Paul and Caroline. This one had EVERYTHING; Coke with ice to start with, burghers, hotdogs, onions and cheese, then fresh slices of pineapple to finish off with. Now THAT was a BBQ. We left the site at 1900 and adjourned to the Queen Vic to celebrate a marvellous days digging. NOTE - (added 3rd August) - don't get too excited about the photograph. Paul must have had his enhance-a-passage™ filter fitted on the camera. The photo is more impressive than the reality. Sketch plan of the entrance to Annieversary. A very hot day (>30°C). Started with Paul and Lucy having a dig and look-see at the end while Tony started unknitting a tangle of wire in the hope of extending the end of the cable near to the junction in WhichWay? We also had another stone throwing session. This time there were a couple of occasions when the stones bounced four times:- bump..bump........bump.....bump, and one memorable occasion when there was a faint continuing trundle at the end. So there could be more down there than we first thought, or it could be just an over-active imagination. We shall see. Then we stopped messing about and uttered incantations and performed certain magic ritual tasks in the hope of enlarging the passage. We eventually emerged to the sweltering heat of the surface at about 1400 hrs. 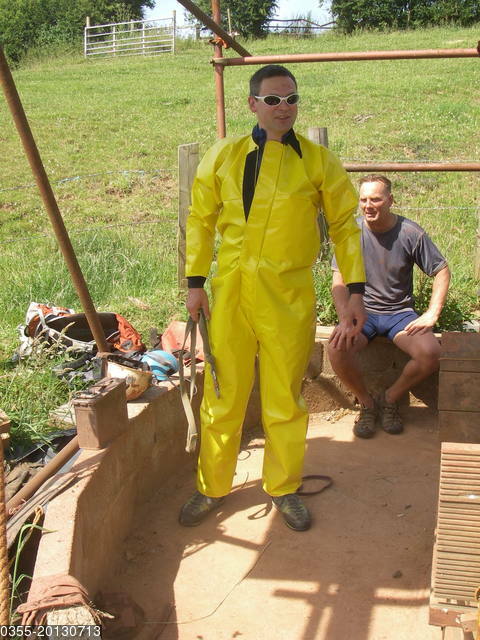 It had been our intention to go down again in the afternoon, but the heat got the better of us and so we sat around eating barbecued hot-dogs and nattering and admiring Tangent's brand new YELLOW oversuit. (Click to enlarge if you have the nerve). We were greeted by a satisfactory pile of rock at the bottom, which was removed in the usual manner - Paul > Alice > Tony > Chris (Windlass) > Nick > Chris (Winch) > Slug > Duncan & Tangent > spoil-heap. From the last statement, it might appear that Chris was indulging in simultaneous multi-tasking, but like the boatswine, he is a cunning fellow and takes some watching - one can never be sure WHERE he is or WHAT he is doing. It's almost as if he operates according to Heisenberg's Principle. [Sorry about that rambling nonsense, but I needed some words to fill up the space to the left of the photograph and they are as good as any(T.A.)]. Once the spoil had been removed it was possible to get a better look round to the right. Despite the efforts of Paul and later Nick, it was not possible to get past the entrance squeeze. We decided on the name 'Annieversary' [with that spelling] for the new extension, because Alice and Tony should really have been in Scotland today at daughter Annie's birthday party instead of grovelling in a squalid hole; breakthrough fever had got the better of them. (They did drive up on Sunday, to make amends). Although is is not possible to enter the Annieversary extension, it IS possible to throw stones in and they bounce three times; bump..bump.........bump, we reckon maybe 20-30ft (7-8 metres). The impacts have a certain resonance so there is a degree of open space in there. Finished the day of with a BBQ - this is getting to be a habit. Where were we ? Two weeks ago, we had worked along the left-hand passage from WhichWay? junction and reached what we thought was a tight turn to the right. We now know that it is tight because an ammo box got jammed in it today and they are 3½ inches (9ish cm) wide. However, just beyond the constriction lie caverns measureless (or so we hope). With this firmly in mind, today's task was to enter into meaningful dialogue with the rock and try to persuade it that it would be far happier lying out on the spoil-heap in the sunshine than languishing in its current filthy surroundings. It was extremely reluctant to accept this and it put up quite an impressive array of counter-arguments, but in the end I guess that some, at least, has been persuaded that it would like to start a new life and join the party sunning itself on the surface next week. Nature Note: Before digging started, Chris and Tony, the first arrivals, were sitting on the Wishing Well drinking tea when a couple of hares came loping slowly over the western rim of the depression and down towards the fence by the stile. Just before reaching the fence they must have noticed us and, instead of entering the site, just continued slowly round the fence and out of the depression heading to the east. Unfortunately Mike spent the 14th to the 22nd in hospital under observation because of a severe recurrence of the breathing problem which has troubled him for some time. Meanwhile, unaware of this, Paul and Caroline were on holiday on Crete, Alice and Tony were on holiday on Bryher and Nick was working in Kazakstan. Thankfully, Mike is much better and back at home, where Hilary is trying to beat some good sense into him and persuade him to take things easy. This is not an easy task, but she is a force to be reckoned with so I guess he will behave for a while. Alice, Jeff, Paul and Tony descended to find a satisfying pile of broken rock at the digging face. After this had been admired, stroked, patted and photographed, Alice, Jeff and Paul took turns in mucking out and dragging back, while Tony hauled and stacked the bags at the base of Tollens'. After a short while, Chris manned the windlass and started hauling bags up to RDR. It was a fairly heavyweight clearing and chiselling session at the face, during which Paul demolished a lot of the right hand wall of the passage. This had originally tried to pretend that it was solid; quite a convincing performance it made of it too. ... and look into that which lies beyond. The best that can be said about this is that it does appear larger than anything that we have seen for a long time and if we could but get into it, then it might be possible to move forward a bit without having to chew away at the walls. A black shadow hints at the possibility of more open space, but we have to enlarge the corner before we can get in and see this. Excitement over, we had a hauling session, with Caroline loading the kibble and Alice, Chris, Mike and Tangent banking, winching, barrowing, tipping and emptying bags. Altogether, 36 bags were hauled to grass, leaving 4 - 5 bags at the bottom of Ding-Dong (now the official name for the third pitch. Has to be, it's referred to as such in the new edition of 'Mendip Underground'). We ended off a fine day by sitting in the evening sunshine enjoying a BBQ, again provided by Paul and Caroline. Paul and Tony had an evening session to see it they could do something about improving access to the left hand route. The photograph is a close up of the 'black shadow' shown in the June 1st photograph of 'WhichWay?' junction. 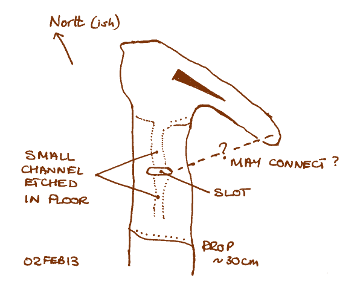 It shows the passage; unfortunately, it lacks scale but it is in the region of 12 - 15 cm wide. OK, so it's a bit too narrow to be comfortable but it does emit a strong cold draught (nearly 1°C colder than the rest of the cave air: 10.3°C as against 11.0°C). Thus encouraged, we sank our teeth into it. It was a pleasant little session; especially so as the Cave Gods had thoughtfully provided a cooling pool of muddy water for the Hiltiman to lie in. Joy of joys. We finished off with a chilli-con-whatnot each in Hunters'. Possibly some beer as well; don't remember. The photograph shows the junction that we have been working towards for some time. The way on to the left is the vertical black shadow above the pool. Small is beautiful so they say. The way on to the right is not in the photograph. Anyway, it's not quite as impressive. We refer to the junction as WhichWay? Junction because we are not sure which way to go, but certainly it's one or t'other. At the junction we lit a bit of old hemp rope as a smoke test. The draught from the left-hand branch was sufficiently strong to blow the smoke horizontally and extinguish the glowing hemp. Spirits soared and we got down to a clearing session. After clearing, it was possible to get right into the pool and look to the left and right. To the left the passage could be seen to continue (about 12-15 cm wide) for about a metre before making a sharp turn to the right (westish). Looking in the other direction, this passage continued for a couple of metres at the same sort of width. At the limit of visibility a small rock, about half a small loaf of bread, partly blocked the view but it seemed that there was a black space beyond. Tony and Paul tried to dislodge the rock by poking it with a long bar but it wasn't ticklish and refused to move. Later in the day, Paul did manage to move the rock but by then his lamp was too dim and plastered with mud to see anything, so we are none the wiser. 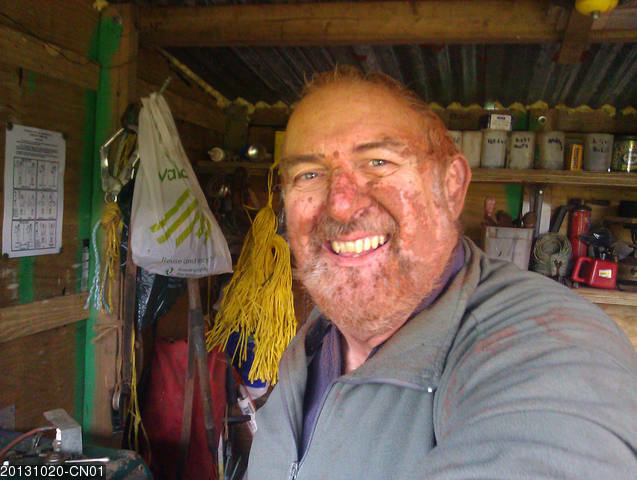 To end the digging session, 25 bags of spoil were hauled to grass with the usual people performing their usual tasks with their usual aplomb and Phil Romford showed a considerable degree of panache by turning up for a visit on his new quad-bike. To finish off the day, Paul had provided the materials for another grand BBQ and we all enjoyed the afternoon sun, the smoke and the burgers. Ian (Slug) said that he was not hungry but managed a double burger interleaved with cheese, onion and sauce - quite disgusting. Crack of dawn (well, almost) and Alice and Tony went down to prepare the dig face for a bit of enlargement. Getting good and close in at WhichWay? Junction, we realised that the draught is coming from the left, rather than the right-hand branch as previously thought. Ritual tasks completed, we both came out. Alice then left for a while as she had to ring [bells] for a wedding in Cheddar. Then came the highlight of the day, Paul lit the BBQ, Clive turned up to join in and we all lounged on the spoil-heap in the afternoon sunshine. Were there more bags to move from the bottom ? Yes there were, but we didn't care. A fitting end to a good days digging. A goodly crowd, a fine warm day and the Lady's-smock, Crucifer pratensis was in full bloom around the site. The omens were good. 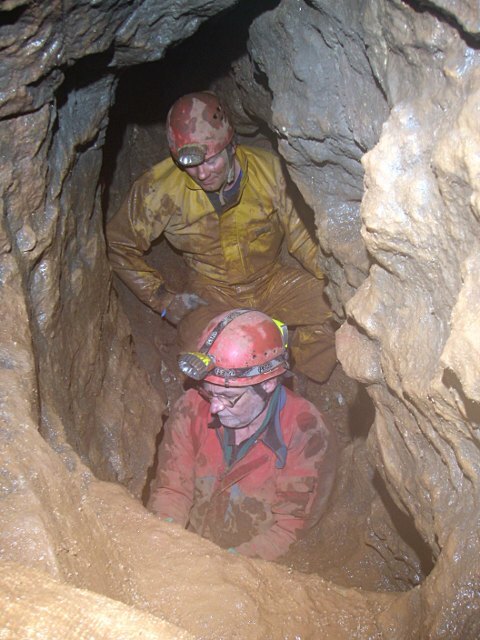 First off an underground inspection, then Paul and Nick started clearing the rubble from the face, Tangent hauled bags and stacked them at the bottom of Tollens. Tony escaped the heavy work by repositioning all the fixings for the water and ventilation pipes, starting at the engine shaft and working down. Somewhat later, Chris went to the bottom to act as bag monitor, Tony worked the windlass and Alice cleared back the bags. Having shifted everything from the bottom, we had our first break, rather late at 1600 hrs. After the break, Paul and Tony went down to drill some neat little holes and the rest of the gang hauled and tipped bags, 32 in all. The enlarged and straightened passage under the west wall now extends for about a body length to enter a constricted cross rift, about 15cm wide. This can be seen to continue to the right (northish) for about a metre and the draught seems to be coming from this branch. The left hand branch is rather more constricted. BREAKFAST AT THE DIG ! 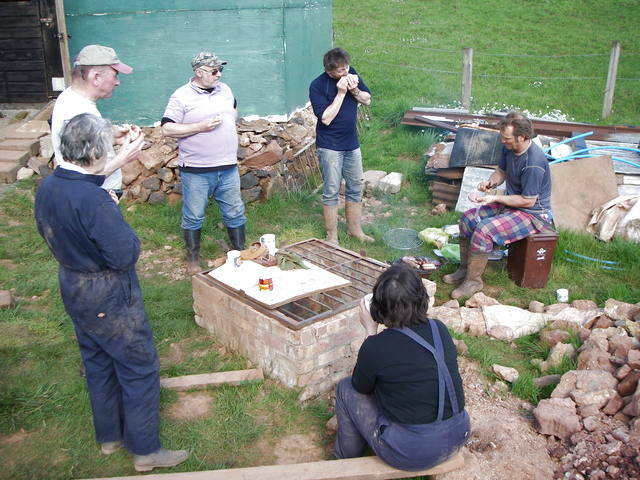 We all had bacon and egg butties, followed by bacon butties, followed by tea before digging. A very good start to the day and we were underground just after 1100hrs. Inspection of the digging face showed that we were beginning to get somewhere and it was now possible to get to the corner and see someway round. 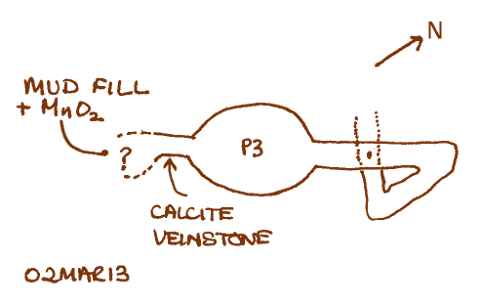 There was a small trench in the mudstone floor, veinstone in the left wall of the continuation, very small stal pendants in the roof at the limit of visibility. AND that was that, it was not possible to go any further. BUT, the faithful cold draught was still blowing as strongly as ever. We all went underground and inspected the dig face. The entrance to the low passage under the 'west' wall has been opened up and we are further in now, but the way-on still continues small with a tight corner at the end of visibility. OK, the 'way-on' is pathetically small but the draught is good - that's better than the other way round. 20 bags of rubble were taken from the dig face and hauled to grass. A quick trip to enlarge the way on. The intimate details are perhaps better left to your imagination. Note: It is now possible to poke a head into the 'way on' and it can be seen to continue approximately 0.5 metre heading south westish before turning a corner to head more westerly. As ever, the passage is small and of irregular section about 12-15cm high and wide. Paul, Tangent and Goon worked on clearing the face. 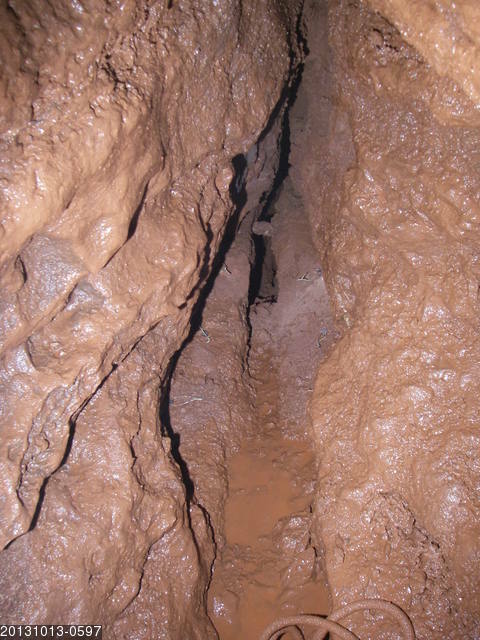 After removing the debris, they could see that the way on continues small, turning to the right (west). It needs considerably more enlargement. After the obligatory break, they cleared 33 bags of spoil with Mike, Chris and Slug attending to the surface work. Henry Bennett and his (very) young son Harley visited in the afternoon. A fine day. To begin with, Paul and Tony went underground to shift some more bags of spoil and continue work on enlarging the way on. This is all getting rather repetitive and not worth detailing, but suffice to say by tea time we had shifted 30 bags of spoil and drilled a ludicrous number of holes in the rock. Tea time and we were joined by Alice who had walked up from Cheddar ! There followed a general consumption of coffee cake. Thereafter, we hauled the 30 bags to grass, then called it a day. Raining all day - very heavily in the afternoon. All three underground. We initially cleared the results of the latest discussion with the rock in the region of the slot. Removal of the choking debris resulted in a strong cold outward draught. The area to the north of the slot had been rather shaken up and Paul was able to chisel out several cubic cavers worth of rock from here (I haven't the faintest idea of the metric equivalent). Much of the constricted acute corner was removed. Indeed, so much so that we broke through the roof of the little passage below and it is now no more. To the north of where the slot used to be there is now a roomy pit, floored with mudstone and it is possible to lie down here in comparative comfort and look eye-to-eye at the way on. This heads into the west wall of the pit, then almost immediately turns south(ish) out of sight. The draught is encouraging, although it is coming out of a very small hole, approx 15cm square. Looking on the bright side, while this might be small, it is a damn sight bigger than the original slot in the floor. 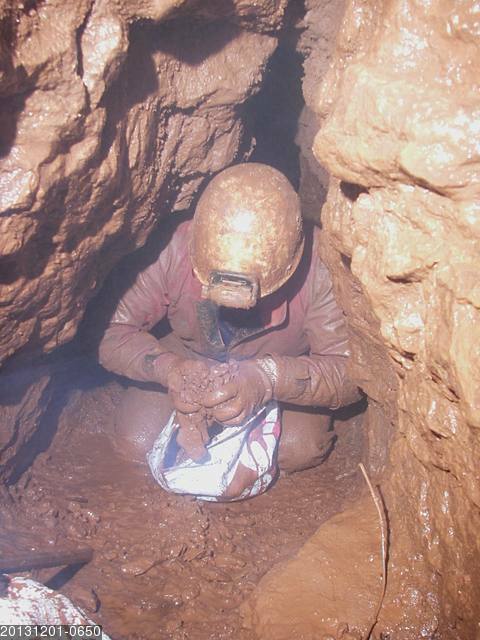 Because of the small team and the fevered excitement of the digging session, no spoil was hauled to the surface and bags were stacked in the chocolate mine and at the bottom of Tollens. 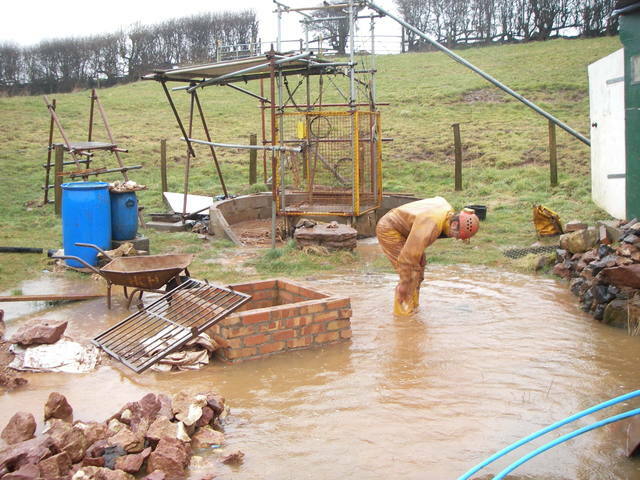 We had plugged the blue pipes in the wishing well first thing and by the end of the day the site was flooded to such an extent that the drain in the apron around the shaft was under water and water was lapping round the shaft itself. Quite useful for washing kit off though. 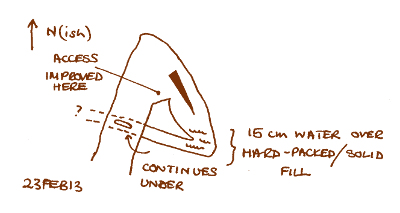 Sketch plan of the dig face. The way on is under the west wall. A quick morning trip to enter into a meaningful dialogue with the slot in the floor and to try to persuade it of the error of its ways. It's being a bit reluctant to co-operate but I think that it is beginning to get an idea of what is expected of it. Exited, cleaned up and then had lunch at Hunters. Continuation of the clearance of the chocolate mine. This is now down to a solid floor with no open way on, but for the sake of completeness, we cleared all the remaining scraps of loose fill out. At least we now have somewhere to store our tools. It was worth a try but it always was a bit of a gamble and we can't win them all. So it's back to the draughting slot in the floor. This will require a LOT of enlarging. The cave makes the rules, so who are we to complain ? Despite the cave mucking us about, it was a very enjoyable session and a warm sunny afternoon for those on the surface. Surface fettling, largely improvements to the catering facilities. We installed the piping for the gas heater and the hob and then fixed the heater and hob into their proper positions. Lots of tedious technical problems required the uttering of strings of magic words, but in the end it all worked to our satisfaction. OK, so it's probably too late in the year for the heater to be much use but we are in this for the long term. Winter will come sooner or later, it always seems to. Last thing, we emptied the 53 bags that were left over from Saturday and sent the empties down the shaft, ready for next Saturday. A fantastic days digging, great fun and a mega clear-out, with spoil flying in all directions. The session was much too hectic and complicated to describe in detail, but at various times Chris, Jeff, Olivia, Paul and Tangent dug in the chocolate mine; Tony operated the windlass; Alice, Olivia and Tony dragged bags hither and thither then stacked them in neat piles; Olivia filled the kibble; Chris drove the winch; Slug worked the bank and Alice barrowed bags....PHEW ! We finished late, rather too late to empty the bags that had been dumped on the spoil heap; they will have to wait for another day. The Chocolate Mine has now been roughly cleared. Unfortunately, it doesn't look like quite such a good candidate for the way on as previously thought. It may well bottom out to a mudstone floor. Nevertheless, hope springs eternal and there are still many bags-worth of mud and rock to remove before it is completely clear, so the situation may change. 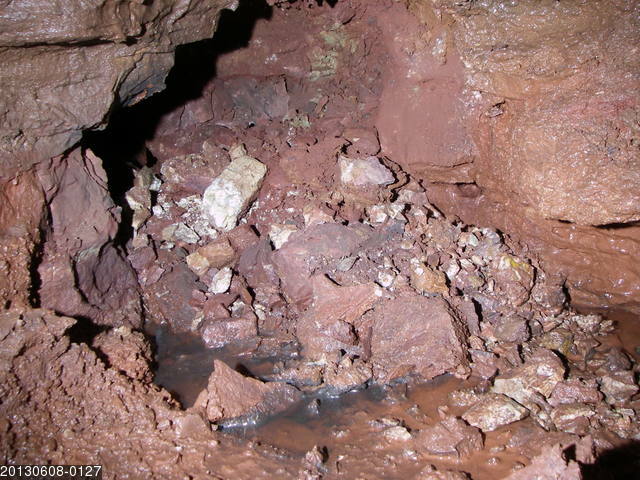 We replaced the pipes, belting and the ladder removed on Wednesday and found that the way into the chocolate mine was now wide open, although hidden behind a large pile of broken rock. The 'mine' itself was was seen to be circular in section, about a metre in diameter with a small choked aven in the roof. There was no obvious way on except possibly under the mud fill. Inspection over, Paul remained below filling bags, Tony wound the windlass and Alice dragged and stacked bags. In the meantime, Chris had arrived laden with copper pipe, gas fittings, blow-torch and the like ready to install the pipe-work for the new gas hob. He then found that the fittings did not match and uttered magic words. End of story for now. By the time the underground crew broke for lunch (1430), 24 bags were stacked at the base on the engine shaft and Mike arrived reporting for light duties. Lunch over, Paul went to the dig face again, Tony filled the kibble, Mike drove the winch and Alice and Chris took turns on the bank and the barrow. While we had been doing this, Paul had filled another six bags, so we hauled these to grass as well. Finished the day with tea and jam doughnuts. Some time ago, we had been given a double burner gas hob and grill by Marilyn McManus. This had originally belonged to Marilyn's father who had used it in his camper van. Just what we wanted for the dig - and we are very grateful for it. Having fettled it and polished it until it shone like new, it was now fixed into the shelter, with the promise of feasts to come. OK, it still lacks piping and a gas supply but that is a minor detail. It does you good just to look at it. Alice went down to the windlass seat and Tony to the bottom of Tollens. Together we hauled back the blue water pipe that had been installed last weekend, then we hauled out the ventilation piping and conveyor belting (to prevent it being damaged; it will be replaced later). 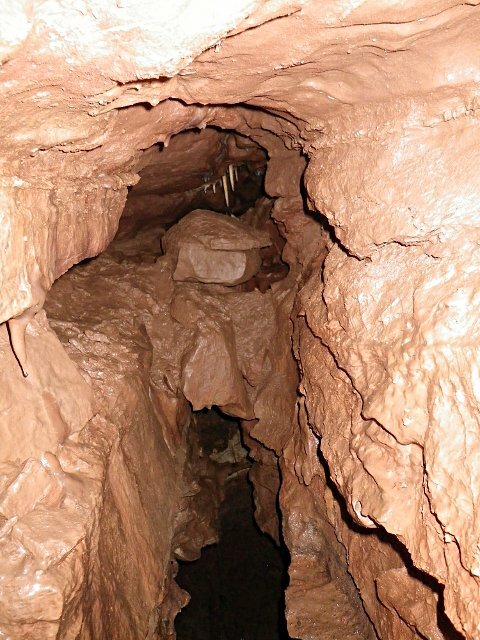 This done, Tony had a go at enlarging the entrance to the Chocolate Mine. 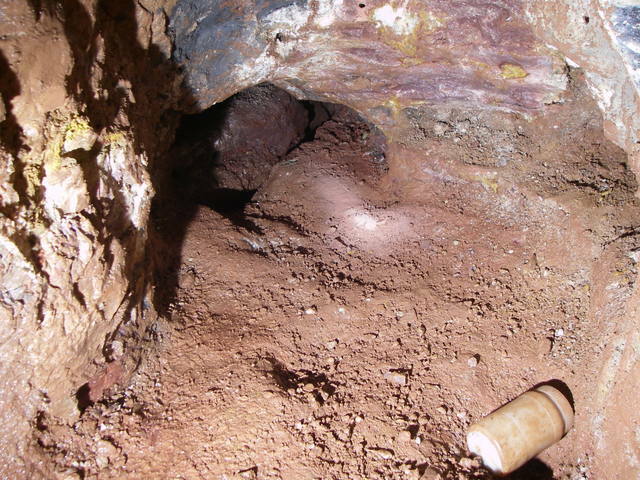 It is worth having a good look at this area as it is much more amenable to enlargement than is the slot in the floor, where the rock is very hard and apparently laced with bands rich in silica so it's very difficult to drill. If there is a possible way on hidden below the chocolate then all well and good. If not, there is always the slot in the floor to fall back on. We are spoiled for choice. Very cold (2°C) with occasional heavy showers of rain then heavy hail storms in the afternoon. Despite this it was relatively enjoyable underground, although somewhat damp. It was still too cold for Mike to come over as he has been unwell and feels the cold keenly. However, spring is on its way, we hope. We plugged the blue pipes in the wishing well with hi-tech wine corks, then Alice, Paul and Tony went below. Paul concentrated on enlarging the hole in the floor, Tony continued the emptying of the chocolate mine and Alice worked the windlass. Paul enlarged the hole in the floor until he was able to get his head into it, but then could not see anything, not having eyes in the top of his head. However, there seemed to be a narrow bedding space down there which extended to the south and west. 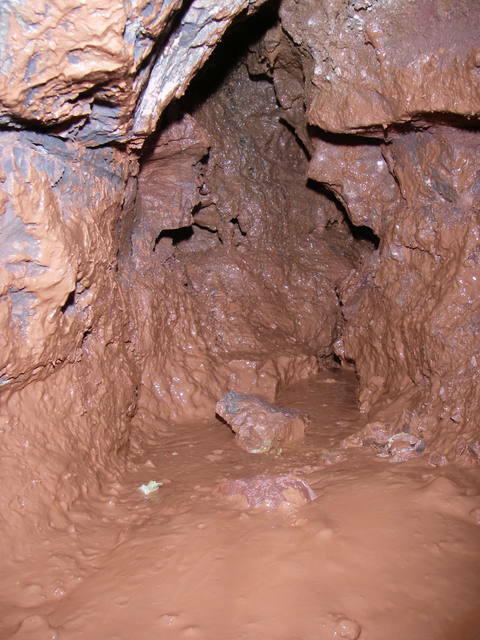 Meanwhile, in the chocolate mine, several bags of mud were removed, exposing diminutive stal curtains on the west wall. This wall undercut to the west below the curtains, but it was not yet possible to see if this was the top of a passage or a bedding plane or just an undercut plain and simple. More chocolate needs removing. Yum ! We cleared the remainder of the bags and stacked them at the bottom of the engine shaft, then broke for lunch at 1440. On the surface, we met up with Chris who had arrived some time earlier. After lunch we installed a length of 25mm diameter blue water pipe that Mike had provided. This ran all the way down to the bottom of the dig and we coupled the upper end to the (lower) end of one of the blue drainage pipes near the bottom of the engine shaft. On the surface by this time the water in the wishing well was 20 - 30cm above the level of the pipes. Removing the hi-tech corks allowed water down the pipe, hopefully to wash out some of the blockage below. 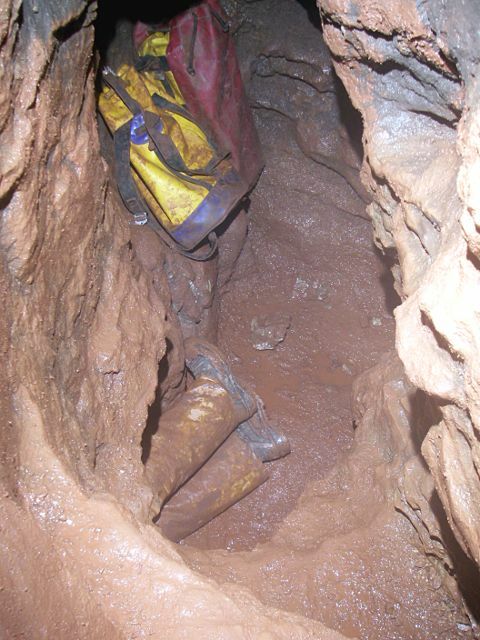 We will leave the pipe in position in the hope that it will hydraulically mine its way to glory. Finally we had a hauling session and cleared the 28 bags of spoil from the dig. Took the three lengths of fixed ladder (made in January) over to the hole, then Tony started with a severe bout of hypochondria and went off home to bed and slept for nearly 24 hours. So, we didn't get much done, but we did all get to the dig, so it gets written up. 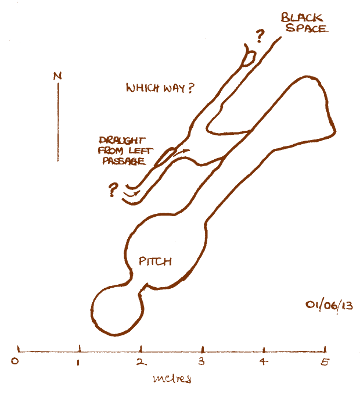 For some time, Paul and Tony had each been having quiet, solitary probes at the mud filled area at the base of P3. Each one having a quick dig when he thought the other was not looking. 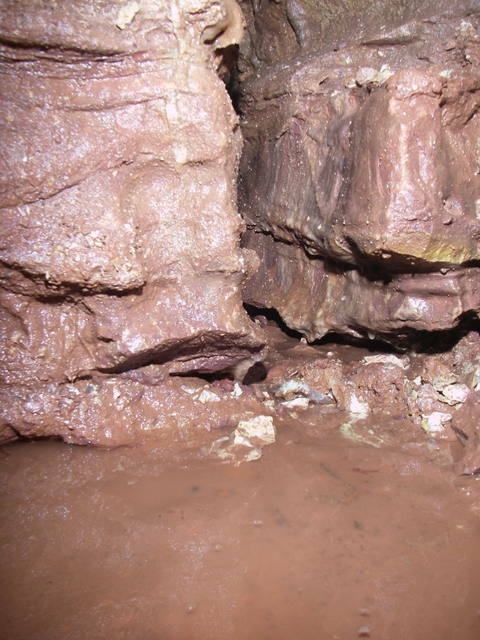 This area was a southward continuation of the vein at the bottom of P3, and will be referred to for the time being as 'the Chocolate Mine'. We both decided to have a serious look at this area because it might prove a easier route to the west, where it seemed that the dig was determined to take us. Also, it appeared that the air here always seemed fresh, so there was the possibility of a small open way on. 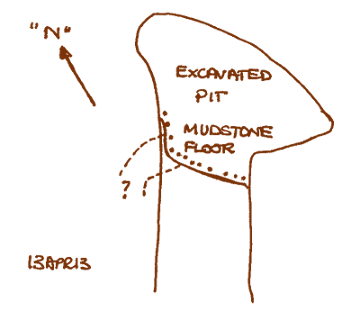 The entrance to the area was a 5" (12cm) wide vertical slot in the south wall of the pitch, with calcite veinstone on the left. 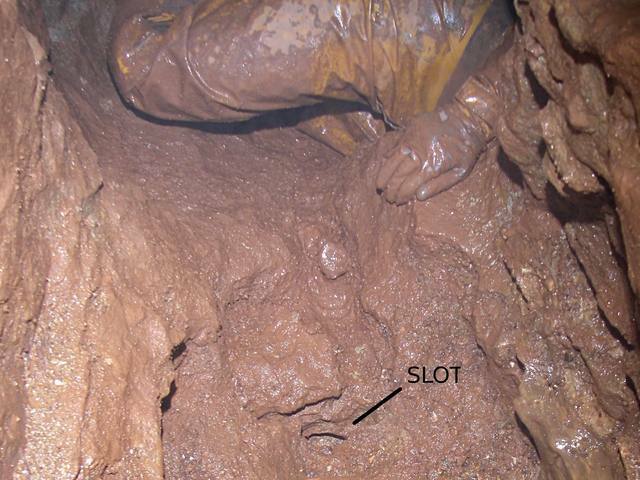 Beyond the slot was a fill of soft mud mixed with occasional earthy masses of MnO2. Some two and a bit feet in (~<1m) it enlarged to a small chamberette, but it was not possible to see or get at the left and back walls of same. 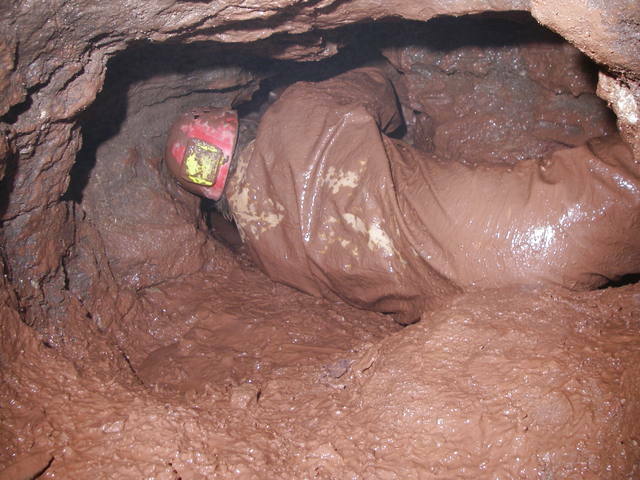 While Paul was covering himself with gloop raking the chocolate out of the mine, Tony started on enlarging the slot in the floor. We ended the morning session at about 1400 and exited to meet up with Chris and Nick. After a long lunch and natter, Nick, Paul and Tony went down to inspect the results of their handywork, but did not stay long as the air quality was rather poor. Back on the surface, we had a debriefing session in the sunshine. Nick had brought his portable X-Ray fluorescence analyser (Sci-Fi Ray-Gun) and we had a look at some samples of drilling dust which had been collected on 16th Feb. We had been concerned that the drilling dust might contain a high concentration of lead but the analyser showed only a very small trace, a relief. Paul and Tony to the bottom to inspect the pile of broken rock. Very satisfactory both in terms of quantity and quality. When this had been cleared, it was possible for us to have a good look at the end. Now, the plan of the end is a bit like a horse's head in outline. At the horse's mouth end was now a squalid puddle. Putting one's head into this it was possible to see along a low arched tunnel heading west for at least a couple of metres. The tunnel was about 30 cm wide with some 12 cm air space above water level. The water was about another 12cm deep, so you will appreciate that this was not huge passage, but it was better than nothing. This arched passage headed back under the approach or, if you like, under the horse's neck. As you might well expect, this new passage connected with the slot in the floor, so going down through the slot will be the "easiest" way to get into whatever lies beyond. Anyway, enough of this excitement, it was the end of the morning session and so out for lunch to find that it was snowing quite hard. Thank goodness for the shelter. After lunch, we had a clearing session, shifting 31 bags from the bottom and hauling them to grass. Pretty good with just three. As we were packing up, Rob Bruce, his son Mitch and Mitch's friend Jonny Boland turned up to see what (if anything) was going on. We all went below and continued clearing bags of spoil from the bottom. 31 bags later, we broke for a lunch. After lunch, the clearing continued and a few holes were drilled in the floor and east wall near the acute bend. Samples of the drilling dust were taken for Nick to analyse for lead levels. We had retired to the shelter for tea, flapjacks and the like when Clive North appeared with his spare Hilti battery in case we needed it; we didn't, but the thought was much appreciated. More tea and nattering ensued. After 30 minutes or so, Paul went to the bottom of the engine shaft to load the kibble, Chris drove the winch, Alice banked and Tony barrowed and tipped (and Clive watched). We had a final round of teas, then packed up and left just after 5pm. To the bottom for another inspection. Other than the small slot in the floor, there was no obvious source of the draught. However, it is just possible that there may be some development at the far eastern end, which is choked with rubble. The passage is too narrow to get to this end at the moment; some general enlargement of the area will be required. In preparation for this, we started on clearing the bottom of the dig and 25 bags of spoil were sent up to grass. To start with, Paul went to the dig face, bagged up the spoil and Tony hauled and stacked the bags at the bottom of Tollens. Then Tony joined Paul at the bottom and they had a brief thinking and probing session. 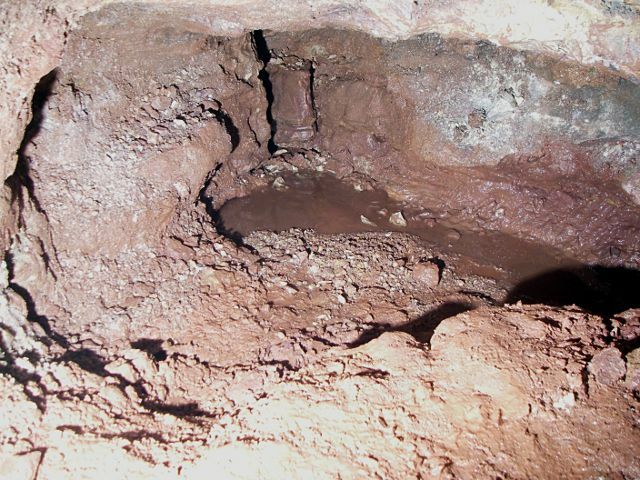 The floor area around the slot was seen to be completely solid with a small channel etched in the solid floor up- and down-stream of the slot itself. 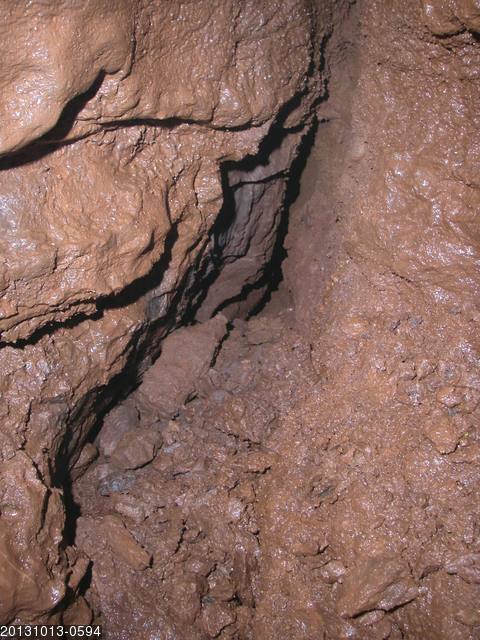 The fill at the bottom of the slot was mud and stones and a wrecking bar could be inserted to full length in the hole, say 60+ cms. A cold draught issued from the slot but we were not sure that it was sufficient to account for the air movement experienced at the bottom of Tollens. The slot and associated mini-trench is an interesting feature and it would be a shame to get rid of it unless it is absolutely necessary. It is possible that the slot may connect at lower level with the right hand end of the cross rift so it might be better to have a go at the floor there to start with. Thinking over, they both came out for a lunch break and met up with Mike who had just arrived and was feeling a bit under the weather. After lunch, Paul and Tony went down again and hauled the stacked bags to the base of the engine shaft, whence Mike winched them to grass. A total of 26 bags, quite creditable with only three diggers. 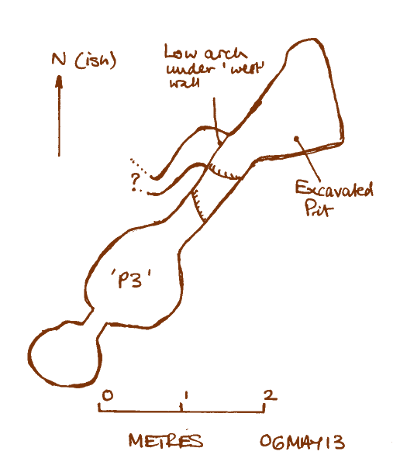 Sketch plan of the dig face. Walked over to the dig through quite deep snow and then spent most of the day working on various items of infrastructure. The only task worthy of mention was the sealing all the joints in the ventilation pipework in the shaft. This was achieved partly by covering the joints with short lengths of motor bike inner tube neatly secured by cable ties and partly by slathering silicone goo liberally over anything that was within reach - my preferred method. We had originally planned to dig today, but the weather was too much for us (wimps). 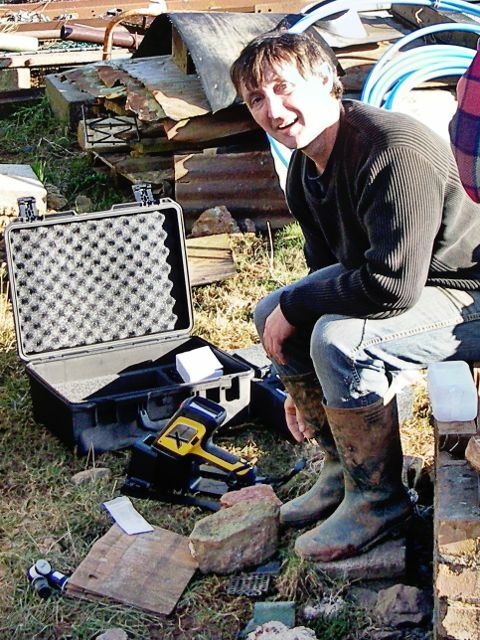 Nick Hawkes came round to Cheddar with his Olympus X-Ray Fluorescence (XRF) analyser and we had a poke at some samples from the dig. 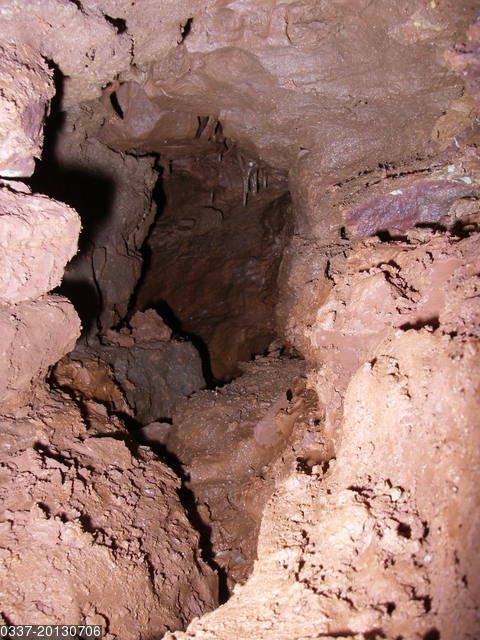 Particularly, we were worried that the drilling dust from the calcite spar might contain high levels of lead (Pb). We (or rather, he) looked at calcite spar and galena speckles from the dig and for interest's sake compared these with a sample of galena from Halfpenny Hole (Charterhouse on Mendip) and a sample of grey ("medieval") slag from Velvet Bottom, (Charterhouse on Mendip). Some Details: This XRF analyser scales up to 10%. Anything over this, (as indicated by >10%), is equivalent to "a lot". The HCH galena sample is missing the trace elements because I forgot to write them down at the time. Also the high iron reading for this sample may be due to surface contamination. Nick has kindly offered to rezap the sample sometime soon. Some More Details: Note the high arsenic levels in the galena. This made Mendip lead eminently suitable for the manufacture of lead shot as the arsenic made the shot somewhat harder than pure lead. This, in turn, accounted in part for the development of the Bristol shot making industry. Some Trivial Details: Halfpenny Hole was dug by Wessex Cave Club for a while in 1966 and named Halfpenny Hole by Tony Dingle after a Georgian halfpenny that he found there. 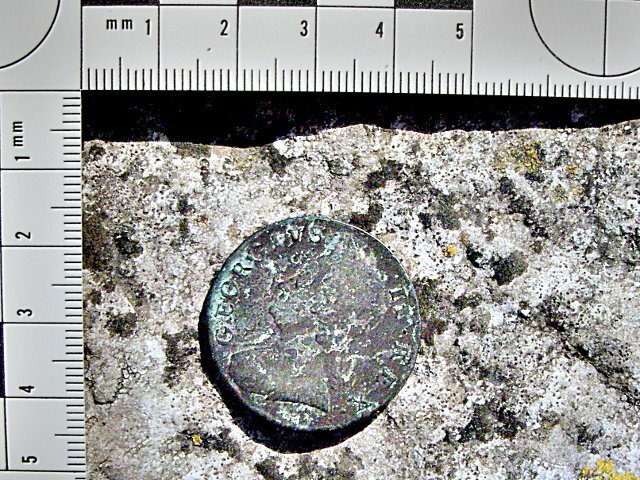 I found the lump of galena analysed above in the late 1960s and photographed the halfpenny on the drystone wall outside Hunters on 5th May 2007. Walked across the field in heavy rain, which stopped soon after we got to the dig. Underground, we settled into a routine with Paul digging, Jeff shifting and bagging spoil and Tony hauling bags and initially stacking them at the bottom of Tollens. Soon after, Alice and Mike came down and started hauling up to RDR clearing the backlog of stacked bags. When Paul had finished off the morning session of digging, most of the floor area seemed to be solid rock with the sole exception of a small (fist size) slot in the floor of the approach passage. 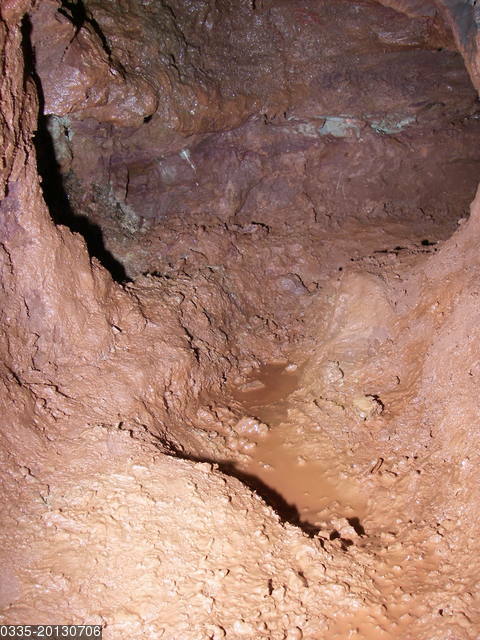 It was possible to see down approx 50cm to a mud and rubble floor below. This does not look too good. So, out for a late lunch and we met up with Chris, whose knee was still very painful and troubling him. After lunch, Paul went down to clear the loose material in the floor by the slot in the hope that this would reveal a better option for the way on. It didn't. Alice, Chris, Mike and Tony hauled out 14 bags plus some loose rock and dumped them on the spoil-heap. All in all, a bit of a puzzle; whence the draught ? We seem to have more-or-less unremitting solid rock on five sides. Time will tell. We came out just as it was starting to snow. Into the tea-room for tea, flapjacks and cake. During this time it started snowing hard with large cotton-wool flakes. By the time we left the site, the world was completely white. Making up three lengths of fixed steel ladder. The return of the winch to its rightful position ! This was followed by a general outbreak of surface fettling; oiling and relaying the winch cable, modifying the scaffolding around the headframe in readiness for re-installing the wriggly tin shelter and generally returning things to normal. All great fun, but not worth outlining in detail.